Map above: Aquitaine today. Click to enlarge. Administratively, mainland France (including Corsica) is divided into 22 regions. These 22 regions are subdivided into 96 metropolitan departments. Today's Aquitaine is one of those régions and includes the French départements of Dordogne, Gironde, Landes, Lot-et-Garonne, and Pyrénées-Atlantiques. Its capital is Bordeaux. Back in the days, Aquitaine was a bit larger. 56 BC - Julius Caesar defeats the Aquitani and establishes the province Aquitania, which stretched from the Garonne River to the Pyrenees. 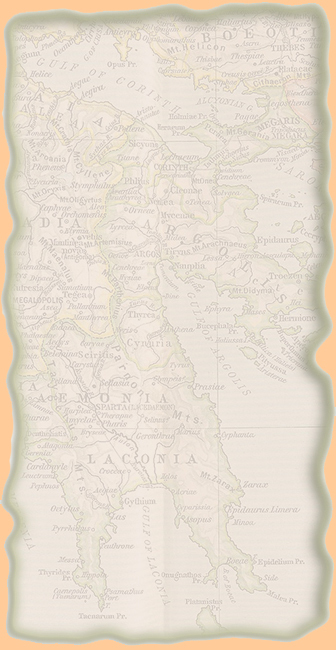 Throughout the years the Romans kept adding territories to Aquitania until it almost stretched up to the Loire River in the northeast. 5th century - The Visigoths occupied Aquitania. 507 AD - Frankish ruler Clovis I defeats the Visigoths. 7th century - Gascony separates from Aquitaine. 718 - Eudes, duke of Aquitaine, was threatened by an Arab invasion. Eudes went for help to Frankish ruler Charles Martel. 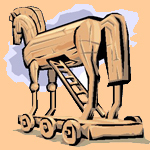 Charles defeated the Arabs in 732. 781 - Charlemagne established the kingdom of Aquitaine and decided his son Louis I would be its ruler. 838 - Louis' son Pepin I died and Louis added Aquitaine to the kingdom of Neustria and gave it to his son Charles II the Bald. The people of Aquitaine weren't happy because they would have preferred Pepin I's son, Pepin II, as their king. But new king Charles was able to shush them. 10th century - A combination of civil war and the invasion of Normans and Muslims caused Aquitaine to be without a ruler per se. But there were folks who called themselves dukes of Aquitaine. 11th century - the Dukes of Aquitaine had become powerful. 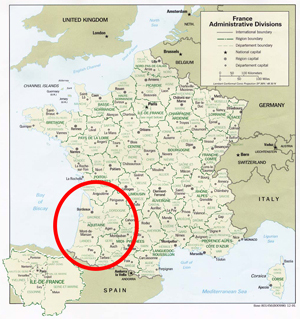 They annexed some of their neighbor's territories and called their realm the Duchy of Aquitaine. 1137 - Eleanor of Aquitaine marries French king Louis VII and Aquitaine becomes French. All is well until Eleanor marries Henry II, the duke of Normandy in 1152. 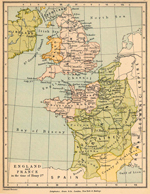 1154 - Henry II became king of England and thus Aquitaine became English. France and England now officially hated each other's guts. France re-conquered pieces of Aquitaine over the years but it took until the end of the Hundred Years' War to get it all back. By the way, until the Hundred Years' War, which was fought 1337 - 1453, Guyenne and Aquitaine was the same. 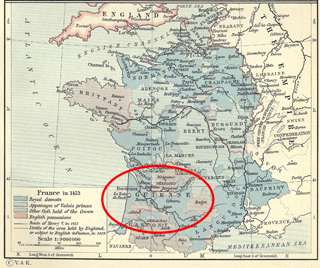 1453 - The French re-conquered Aquitaine, added Quercy and Rouergue to its territory, and called it the French province of Guyenne, or Guienne.